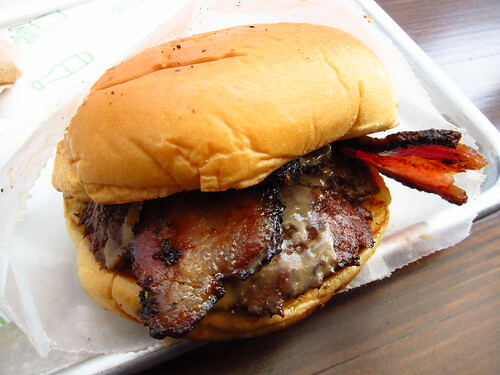 A little less than a year ago, Shake Shack Upper West Side offered a "Peanut Butter & Bacon" burger two Saturdays in a row. Two Saturdays where I could not get to the Upper West Side Shake Shack. A burger that I often think about, reflecting on what could have been. Nearly every Friday after, I've checked the Shake Shack Facebook Page to see if this magical unicorn of a burger would re-emerge. This past weekend, it did with an added extra bonus: Pancakes and Bacon Milkshake. There are two reasons why this burger is so special: one, it's peanut butter and bacon-a combination hard to find anywhere, and two, there's bacon involved. I love bacon cheeseburgers, like "I should be in a Bacon Cheeseburgers Anonymous group" love. While this wasn't a bacon cheeseburger, it involved bacon on a burger, far enough removed that I haven't fallen off the wagon, yet. My burger didn't have nearly the amount of peanut butter sauce as seen last year which allowed me to taste the Usinger's Cajun bacon more as well as the meat. Less sauce allowed the spices from the bacon did dominate the trio, with subtle tastes of the peanut butter. At no time did this not taste like a bacon burger. It would be super awesome though if they replaced the meat with fried bananas. Just the chance to have this special was totally worth it though. 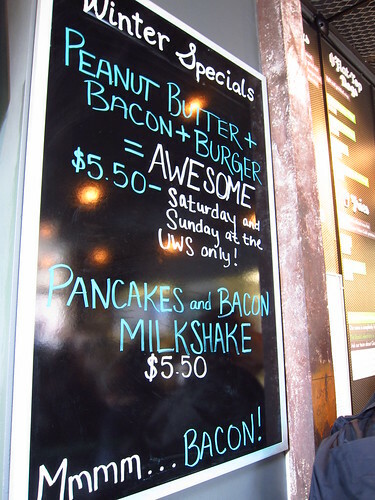 I didn't even realize the Pancakes & Bacon Milkshake was in store until I arrived at the Shack. 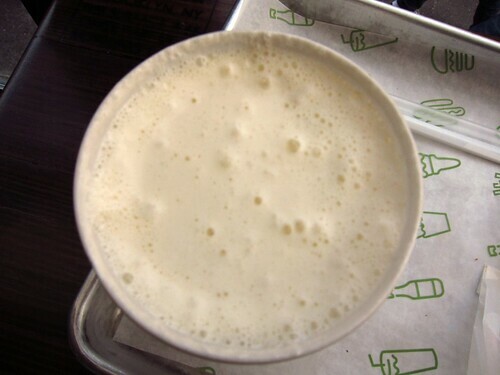 The sweet shake was good enough, you got the batter flavor with a bacon aftertaste. I was a little letdown since I was expecting a thicker shake with chunks of pancake or bacon, but alas, that would mean a concrete. That burger looks freaking awesome. I had to stop reading because I was drooling. Sounds seriously amazing! Your choices in food is awesome! sigh, i cant believe i missed this! That picture makes me want to eat the computer screen. I was at the UWS Shack Shack last Friday and Danny Meyer was actually there talking to the welcome girl about the Peanut Butter + Bacon Burger. I overheard him being pretty skeptical about it and she was insisting it was really good.